MPE has been delivering high-reliability, high-performance EMC, EMP and TEMPEST specification filters for the vehicle-mounted Falcon mobile shelter program. This is the battlefield broadband, ground-based communications system from BAE Systems. Falcon assists and supports ISTAR, the process of integrating the intelligence process with surveillance, target acquisition and reconnaissance tasks in order to improve commanders’ situational awareness and consequently their decision-making. The increase in the use of ISTAR assets delivering huge quantities of video imagery and information demands systems which are capable of handling large amounts of data. 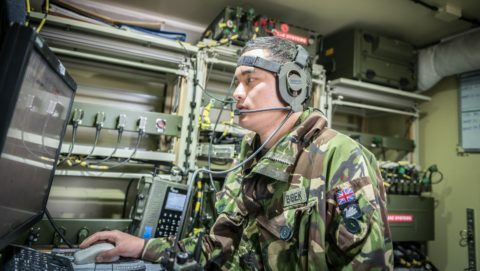 Meeting these exacting requirements, Falcon is fundamental to the UK Armed Forces in providing robust, high-capacity network services right across the battlefield. The four different MPE filter products supplied have consisted of a 63A filter for the main incoming power feed, a 32A EMP filter for the interior of the shelter, six 10A TEMPEST filters also inside the shelter, and a 20A feedthrough capacitor. Providing secure, high-capacity voice, data and video communications, staff at command headquarters can operate across up to four separate security domains on a wide area network. 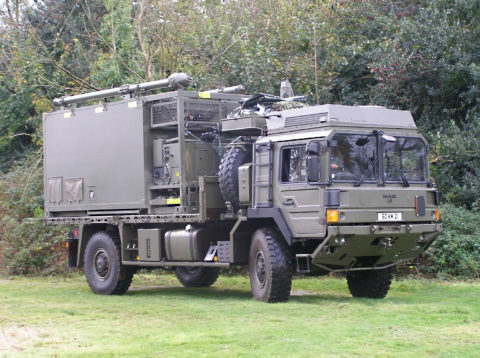 The Falcon system is carried on the British Army’s standard MAN 4×4, six-tonne, HX60 truck (as pictured here) for mobility and flexibility.